Today I am sharing my joys and frustrations of cookware, you know your basic Pots and Pans! Most of us have a set we have had for a while but when do we replace them? When do we take the time to decide it is time to “Invest” in new cookware? I am at the place where my cookware needs updating. I cook each day and I own nice Calphalon pans. However the saute pan I use most days is over 6 years old and everything has been sticking to it! So I am dealing with this pan and getting frustrated and thought okay maybe it is time to start looking. I went directly to Williams Sonoma. I think they are the go to for the kitchen. The staff is friendly and very knowledgeable. They have a fairly new line of pans called Williams Sonoma Professional Ceramic Nonstick. LOVE! These are not your normal nonstick pans, they are ceramic and beautiful! It doesn’t hurt that they are gray and match my kitchen! I discovered when you go into WS they always have some aroma going on the stove! The day I was there they were cooking onions and peppers and this was the pan they use. The onions and peppers basically cook all day and then they clean the pan at the end without any trouble. I was impressed! I still am not ready to invest in the entire set of cookware but I truly needed the saute pan. 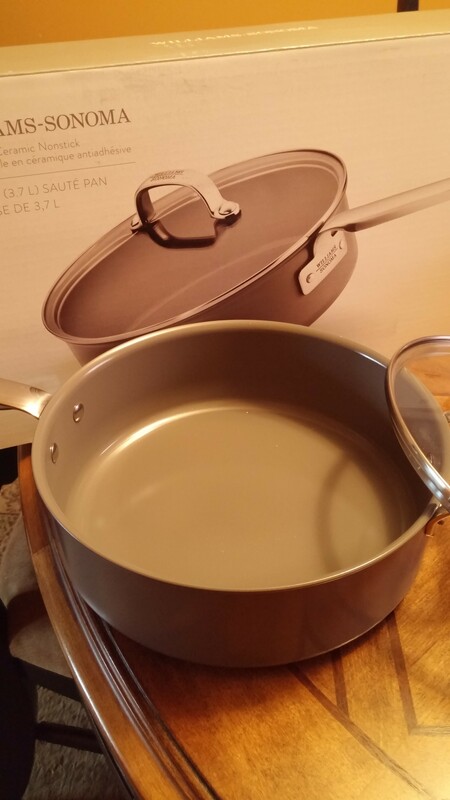 I was fortunate enough to receive a 20 percent off coupon in an email plus free shipping so I purchased my pan for a great price! I purchased the 4 quart saute pan. I have used it several times already and love it! Especially the clean up! Twice I have used it to cook ground chicken. 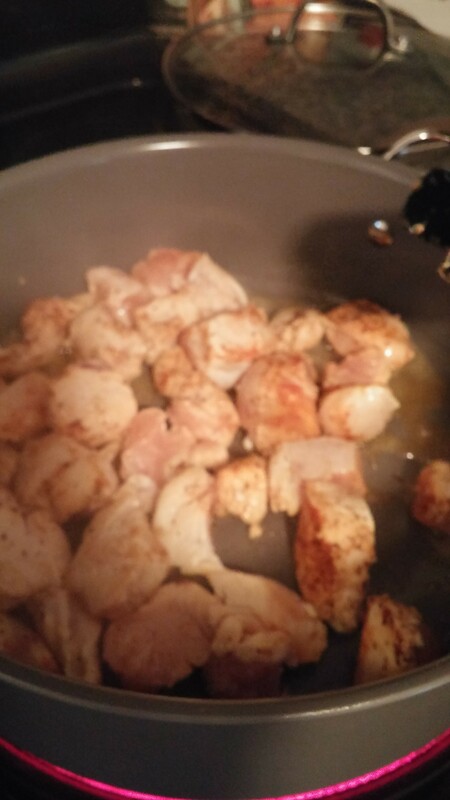 I cook ground chicken probably longer than most do, I want to make sure it is cooked through! I usually get some sticking but not with this pan! It doesn’t stick and clean up is literally a breeze! I still think my other Calphalon pans have life in them and although I would love to replace them with all new Ceramic pans, I think I will wait a bit. I might be passing some of them down and then I will get my new pans. No need to get all Ceramic just to have new if your old pans still have life! So that is the end of my Pots and Pans ramblings! I will share the following pictures with you! The first is the pan when it arrived all shiny and new, the other 2 pictures are the first thing I cooked in the pan! 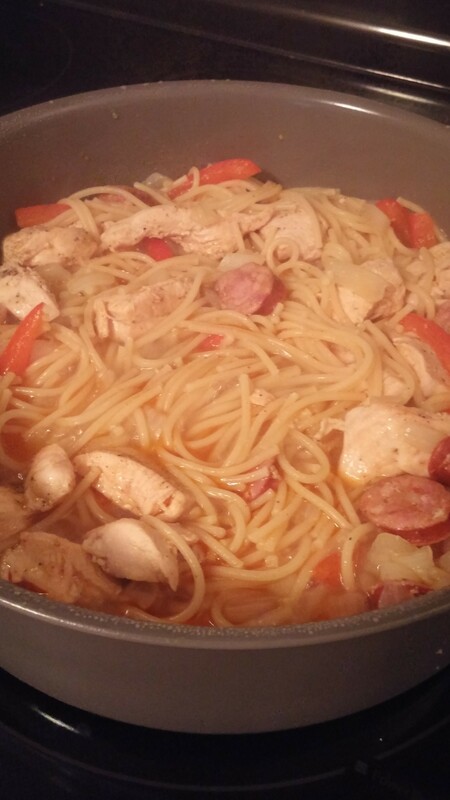 I used a recipe from the Facebook page Tasty for One Pot Cajun Pasta. If you haven’t checked out their page yet, do so! They have quick videos with delicious recipes! This recipe was a great one pot meal and was a big hit! It smelled so good!